RENEW YOUR LICENSE PLATES ONLINE AND PICK UP YOUR TABS AT OUR EXPRESS SERVICE COUNTER. Hit the road with our help! Get your business or non-profit started! 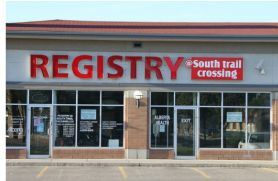 Visit Our Office: Registry @ South Trail Crossing Ltd. Most of the transactions processed at Registry @ South Trail Crossing require that the customer appear in person with proper identification. To make your experience as simple and efficient as possible please contact us. Alternatively, you can find the service(s) you are interested in on our Services page and review the items to bring with you. Preparing for your driver's licence test? Study for your class 7 knowledge test. Study for your class 6 knowledge test. Study for your class 1, 2, 3 and 4 knowledge tests. Visit Transportation Alberta for more information on road tests. Registry @ South Trail Crossing provides an in-person channel for Alberta Health Care account registrations and changes. New Albertans can apply for coverage and existing residents of the province can update their existing coverage information, including changes to their name, address, marital status and adding or removing coverage for dependents. Please visit the Alberta Health and Wellness website for additional information and for access to the appropriate forms. For more efficient service, please print out and complete the necessary form(s) prior to coming to our office location. There is no cost to clients to register or maintain your AHC account! Please note: Albertans who have already registered for health care coverage do not need to re-apply. From Monday to Friday, 9 am to 5 pm, we provide immediate assistance with new applications and change requests.